First scrape food spills gently with a spoon or dull knife, removing as much as possible. Always work from the outer edge of the stain towards the center to avoid spreading. Blot, do not rub or scrub, as the carpet may fuzz. When using a mild detergent, use a clear, non-bleach laundry detergent. Do not use cloudy detergents as they can leave a sticky residue. Use only 1/4 teaspoon of detergent to 32 ounces water. Follow detergent cleaning with clear water rinsing and then blot to dry as much as possible. Most dirt, and even dust, takes the form of hard particles. When left in the carpet these gritty, sharp particles abrade the pile of the carpet. Regular vacuuming not only prolongs the life of the carpet, but will enhance its appearance as well. Most soiling in carpet is of the dry, particulate type which can be removed with a vacuum cleaner. Use a vacuum with a rotating brush or beater bar. 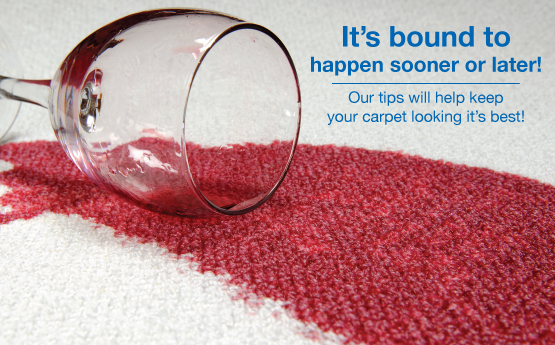 Change the bags often and check the beater bars for burrs and gouges so as not to damage the surface of the carpet. Some thick loop pile carpets will fuzz if a rotating brush vacuum is used. In this case we recommend a suction vacuum only. Even with regular vacuuming, soil particles and oily dirt will cling to the carpet fibers, and with foot traffic these particles and oily dirt are driven deep into the carpet. We recommend professional hot water extraction every 18 to 24 months. Periodic cleaning, using the hot water extraction method performed by a professional cleaner, will refresh carpet appearance.